For the longest time, I used cheap paintbrushes. Then I finally made the leap to higher end brushes. Now it's time to look back and see just how that "high end" brush has held up. This little journey of mine started in October of 2010. It's 9 months later now and I've come to the point where I need to retire my super-duper good brush from front line duty to backup work. It's been quite a ride along the way. I started out using the cheaper end paintbrushes that most of us use. That original post spawned a two-part Guest series discussing the differences between brushes. That's when I made the leap and picked one up for myself. With some help from some friends, I was set straight. Five months later, I updated everyone with my progress. Despite my repeated attempts to kill the thing, it was holding up like a champ and performing flawlessly. And that brings us to where we are now. Nine months into this and my paintbrush has seen all the front line work she can handle. After one of the regular weekly cleanings, I took a look at the tip of my brush and noticed it wasn't as sharp as it used to be. A quick comparison against the new paintbrush I had waiting on the sidelines showed the difference nine months of heavy painting can make. The tip is considerably shorter and not as fine. It still has a good tip to it, but I can no longer get the super fine detail I could before. The body of the brush has held up nicely as well. It still has it's shape and regular cleanings have extended it's life and helped I'm sure. I won't be throwing my brush away. It will be doing mostly basecoat and wash work now. I'll bring in the new one for detail work when needed. I've already ordered a new one from Secret Weapon Miniatures. In the end, I'm glad I spent the extra money and went with the higher quality brush. It's made a huge difference in what I can paint and the speed and ease in which I can do it. For an operational life of nine months on the painting front lines, I can't complain at all. If you're still using "cheap" stuff like I used to do, I highly recommend you give the good ones a try. You won't be disappointed. Thats a good amount of time in service, based on the fact you do a ton of painting! Im about to start using the "good" brush I ordered after your last article, wierd how things come around... what can I say I have been on a 5 month painting holiday! I got a Windsor Newton series 7, so I shall see how I get on. If I get that amount of time and decent amount painted I will be happy. Still looks like a very usable brush as well. 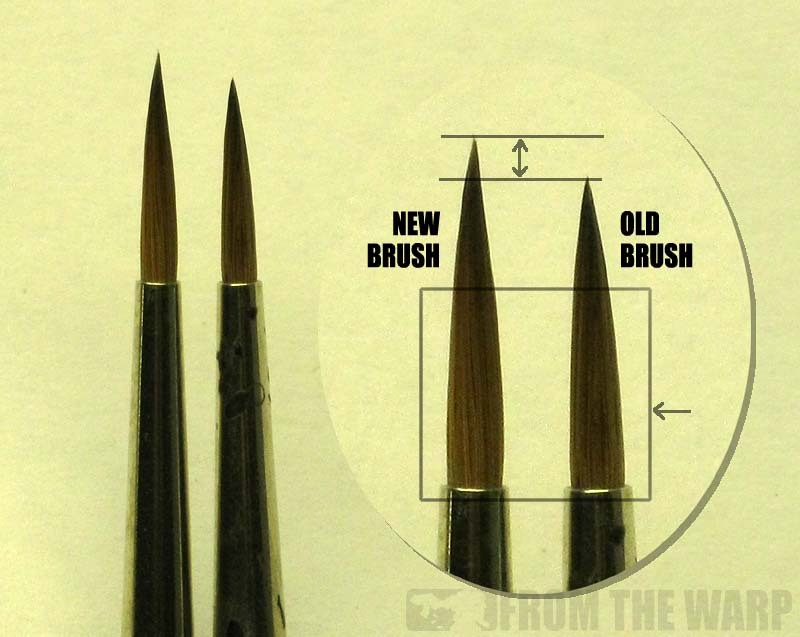 Very interesting on the brush shrinkage! Would you mind measuring both brushes? A size 0 8404 is supposed to be a nice, round 1 cm in length. About how many models do you think it has seen in 9 months? Great stuff Ron. 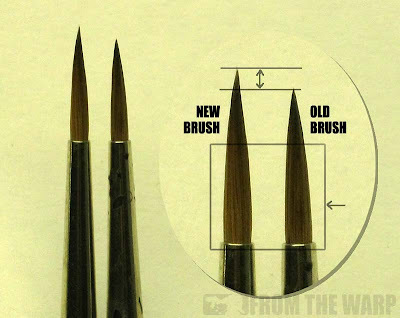 I made the changeover to better brushes based on the posts here and while the ones I picked up didn't last quite as long as yours have (my first two 'good' brushes ware relegated to basecoat and wash duties a few months back), I have to say that you were right. I'm a convert - the amount of detail and control is just way better, no more cheap brushes for me! Sometimes brushes vary slightly in lenth. Would you mind and compare the spare one with the new one when it will arrive? I live in Poland, Europe. Is there some closer distributor of those brushes? I'm with you in that I finally made the jump to using a good brush after Adepticon this past year, after taking a class with Matthieu Fontaine. I picked up the exact same brush you did and that series of brushes (I picked up a few different sizes or myself) has made a HUGE difference in painting. You get what you pay for, and a good tool is worth alot! @Jess: Except that one good $10 brush will last longer than three $3 brushes and you'll get more control out of it, for better painting, in the bargain. It's hard to argue with a good sable brush. Of course they're the only non-Secret Weapon product on the site because I wanted to make the Raphael 8404 brush available to a wider hobby audience. I also use the Raphael 8404 brushes. From misterjustin no less :) I urge anyone who cares about their painting to do two things. Thin their paints (plain water may or may not be your thing) and get a good brush. And don't get a tiny brush, they hold far too little paint to be useful for the majority of painting. Also paint with the side of the tip. Makes a huge difference. Im using a Series 7, Im really pleased as I was a cheap brush man, I cant stress enough the amount of control you get compared to cheap. Is it regarded that the Raphael 8404 is the best now... if so why, is cheaper than the series 7, or just better.. ? @Flekkzo: Thanks for both orders... even if the second was for a bummer of a reason. Of course I just ruined one myself for the same reason. Oops. RealGenius: The new brush comes in at 11mm from the very super-fine tip to the base where the metal starts. That's the distance of the one that hasn't been used at all yet. As for number of models... I'd say somewhere in the vicinity of 40 infantry models and just over 5 vehicles. And that does not include any of the dozens of little projects I've done along the way like painting a couple helmets, or a cloak or a few arms for something. And that's to the point of being able to paint above a tabletop level. Now I can't do that with the brush since the super-fine tip has gone away. I can still get regular "tabletop" results and do normal line work, I just can't get that super clean edge and line work. lehcyfer: I'll be watching the next brush to see if I get the same life out of it as well. Jess@PBT: If I'm painting something that might do more damage than normal to my paintbrush, (terrain)... I'll certainly go cheap. Otherwise, it's better for me to use the better quality brush as it helps with my painting and gives me the better tool to use.